Very few headsets out there are “true” surround sound. Most are traditional stereo headphones with “virtual surround sound” — a process that adds depth and directionality, but delivers it through two speakers. Headphones like Tritton’s and Psyko’s actually use multiple drivers to simulate being in a room with, say, five speaker channels and a subwoofer. They’ve had mixed success, but maybe Razer will have more luck. Their upcoming Tiamat headset uses no less than 10 individual drivers (5 in each earpiece) to produce what they are saying is a world-first 7.1 sound experience. I’ll believe it when I hear it, though: the Megalodon sounded great with the right inputs, but failed to “upscale” plain stereo well. Hopefully the Tiamat handles that better. 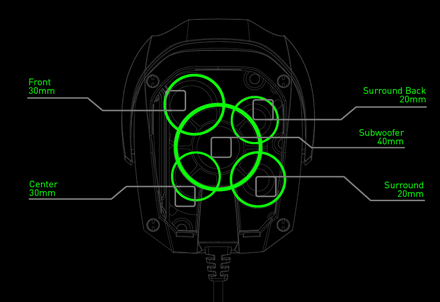 The new headset has a front, rear, side, and center channel in each earpiece along with a subwoofer. You can adjust each channel separately on the handsome puck. There’s a retractable microphone, of course. The Tiamat 7.1 has a little sister, the Tiamat 2.2, a virtual-surround headset with a similar design. Looks like an updated version of the Chimaera. They should be shipping later this year; the 7.1 costs $180 and the 2.2 will cost $100. More details can be found at the Tiamat microsite.